Wondering if Puggles are perfect fit to your family? As cute as their name, these snuggly dogs have quickly risen in popularity. In the world of designer dogs, Puggles are the product of cross breeding Chinese Pugs to Beagles. These robust little dogs stand approximately fifteen inches tall at the shoulder and can weigh anywhere from twelve to thirty pounds. Happily, Puggles carry a good combination of their parent breeds' temperaments, and in general are very friendly, outgoing dogs who make wonderful family pets. They are usually up for a good romp, but are also happy to spend time snuggling with their human companions. These dogs also tend to be quite patient with children. Nevertheless, as with all smaller dog breeds, parents should supervise playtime to ensure pets aren't accidentally harmed by unknowing little hands. Like many small breeds, these dogs will bark to alert their owners to anything going on in their territory. However, they are also perfectly capable of letting out one of those famous Beagle howls. If you've never heard this sound before, it can be a bit startling and sounds something like a howl combined with a yodel. Puggles tend to be people pleasers, but basic training does take some effort. This is mainly because these dogs love to play around and sometimes find it hard to settle down to business. 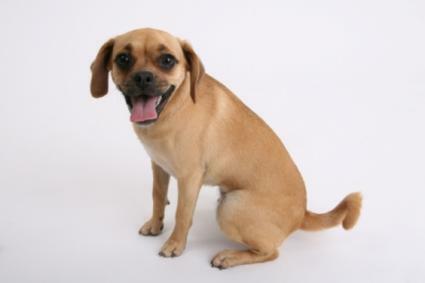 In particular, potty training Puggles can present an even greater challenge, and should be approached with diligence. The coats of these hybrids are short, so bathing is quite easy and only needed once or twice a month. Between baths, make sure to clean inside the folds of wrinkled skin to remove accumulated debris, or else bacterial build up can cause a foul odor. Shedding is also part of life with a Puggle, but regular brushing will help reduce the problem and will keep your pet looking fresh. Being a naturally active dog, the need for nail trimming is minimal as long as pets are allowed to have plenty of outdoor exercise. The ear flaps of a Puggle fold over, further restricting the air flow in those already tight ear canals, so a weekly ear examination and cleaning is in order to head off any possible infections. Puggles carry genetics from both parent breeds, therefore they can be prone to all the same health concerns to which Beagles and Pugs are susceptible. However, Puggle breeders believe that cross breeding actually dilutes the potential for many of these same health problems. Is Puggle breeding simply the latest fad, or will these dogs someday be developed to purebred status? Only time will tell us for sure, as for now, Puggles are enjoying a surge in popularity that should keep them around for some time to come.